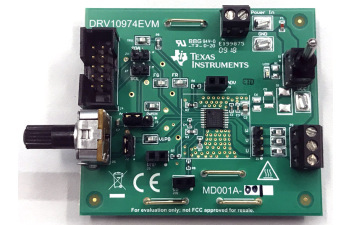 The DRV10974EVM (evaluation module) serves as a user-friendly evaluation kit to demonstrate TI's fully integrated brushless motor driver, DRV10974. The EVM is a high-performance, power-efficient and cost-effective platform that speeds development for quicker time to market. The DRV10974 is a sensorless motor driver with integrated power MOSFETs, which can provide continuous drive current up to 1 A (rms). The device is designed for cost-sensitive, low-noise, and low-external-component-count applications. The DRV10987EVM evaluation module (EVM) serves as a user-friendly evaluation kit to demonstrate TI's fully integrated brushless motor driver, DRV10987. The EVM is a high-performance, power-efficient and cost-effective platform that speeds development for quicker time to market. The DRV10987EVM supports sensoreless Brushless DC motors for a wide range of industrial applications, and it is suitable for 12V and 24V motors. It is also able to support the over voltage condition up to 45V.